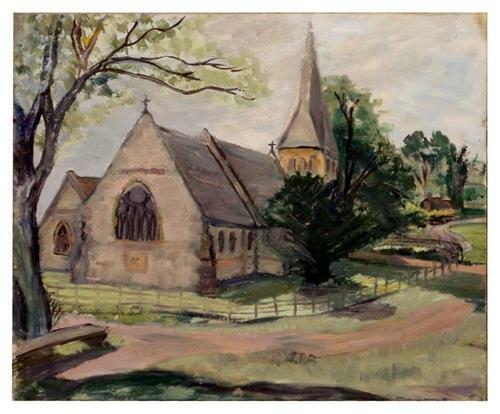 This is an oil painting of a country church by Gwladys Burton circa 1955. Individual works by Gwladys have sold for well over £300. We acquired a large collection of work by the recently deceased painter Gwladys Burton, also known as Gwladys Davies Burton, full name Gwladys Maud Davis Burton. Gwladys was associated with British painter Dancan Grant and a member of the Society of Women Artists. Gwladys was a prolific painter and art collector latterly based on the wealthy Sandbanks peninsular. Much of her body of work takes the form of deceptively simple, even naive, landscapes. However, as you can judge from the other examples of work included, her output is firmly grounded in conventional representational art training and innate talent. Along with over fifty of her exquisite paintings came a collection of invoices, receipts and legal documents. From these documents one begins to gain an insight into a lifestyle of affluence and privilege. (I am particularly tickled by the invoice from GARRARD The Crown Jeweller for cleaning the spout of a silver teapot.) Her various recorded addresses seal the deal on this being a very wealthy woman. Her property in Sandbanks would change hands today for several million pounds. So this was a woman who painted not for fame of fortune but for pleasure; and, judging from her prolific output, almost compulsively. The paintings of Gwladys that are in our possession date from the early '50s to the late '60s and speak of a highly versatile artist who seems to have been in control of an almost effortless talent. She seemingly painted in much the same way that today we would use a digital camera; recording her travels, major events and even the view from her window. You’ll find landscapes, seascapes, portraits and still lives all tackled with the same enthusiasm and eye pleasing colour pallet that very much characterises her work. As we continue to research more of Gwladys Burton's life is being revealed. But, like all artists, the most eloquent evidence of a life well spent is in the paintings she left for us.